We accept children from aged 3 years and older. 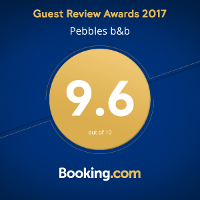 These booking terms apply to Pebbles B&B our officers, employees and agents (“We”/”Us”/”Our”) and the person or legal entity making the booking or to whom we supply services in respect of the Booking(“You/Your”). These Booking Terms are governed by English law and apply to all Bookings except where we agree in writing other terms. By making a booking you are deemed to accept these booking terms. Your reservation request requires that you pay an initial deposit equal to the first night of your stay. The balance of your stay becomes due on departure. A contract between you and us comes into effect when we accept your deposit and/or confirm your reservation request. The deposit must be paid with a valid acceptable credit or debit card, or by cheque. The balance must be paid with a valid acceptable credit or debit card or cash. Cheques are not accepted for balance payments. A valid acceptable credit or debit card must be presented to us on arrival. All published rates exclude VAT. Rates are per room per night including breakfast unless otherwise indicated. Rates do not include other costs you may choose to incur during your stay unless otherwise stated. Rates quoted are correct only for the specific room, nights and dates shown. Should you change the room, dates or number of nights, then the rates are subject to change. In the rare case that due to unforeseen circumstances we cannot provide your requested accommodation, you will be offered alternate accommodation. Check-in and check-out times. Check in is from 16.00hrs. Check out by 10.30am these times are specified on your booking confirmation. Check-in and/or check-out times outside those specified must be confirmed with us prior to arrival. We do not accept luggage before check in other than luggage delivered to the house by luggage transfers for walkers. For cancellations made up to 14 days before your date of arrival, the deposit will be refunded. For cancellations made after this time you will be liable for the first nights stay per room. By failing to take up the booking without cancelling, you will be liable for the full cost of the booking. For this reason we strongly recommend that you take out cancellation insurance, which is inexpensive and can be obtained from any good broker. A £20 surcharge will be applied for lost keys. We have some standard rules that are designed to ensure that we comply with regulations relating to matters such as fire, health and safety and to enhance the comfort and well being of our guests. If you would like to check our conditions of safety please contact us. We reserve the right to terminate your booking immediately without being liable for any refund or compensation where you engage in unacceptable behaviour that causes a disturbance or nuisance to other guests and mistreatment of our rooms. We remind guests that it is against the law to smoke at Pebbles B&B and smoking is prohibited anywhere inside the building. Guests must ensure that cigarettes/cigars are extinguished properly. No naked flames can be used in Pebbles B&B due to the fire risk. Anyone using candles, matches or any other source of naked flame will have their booking terminated immediately without being liable for any refund or compensation.